i love a good casserole. it didn’t used to be this way, though. until recently, i thought that all casseroles were mushy, bland + flavorless – boy, was i wrong! after trying a truly delicious one a few years ago, i was converted into a casserole-lover + now they’re one of my favorite comfort foods – hearty, stick-to-your-ribs meals that are easy to serve + great for a crowd. the other night, it was gray + rainy – perfect casserole weather. after seeing this recipe, i knew that with a few changes, it would be amazing. and it was! first, instead of using plain white rice for the bottom layer, i was inspired by my cilantro-lime rice, + made a flavorful, delicious lime rice. 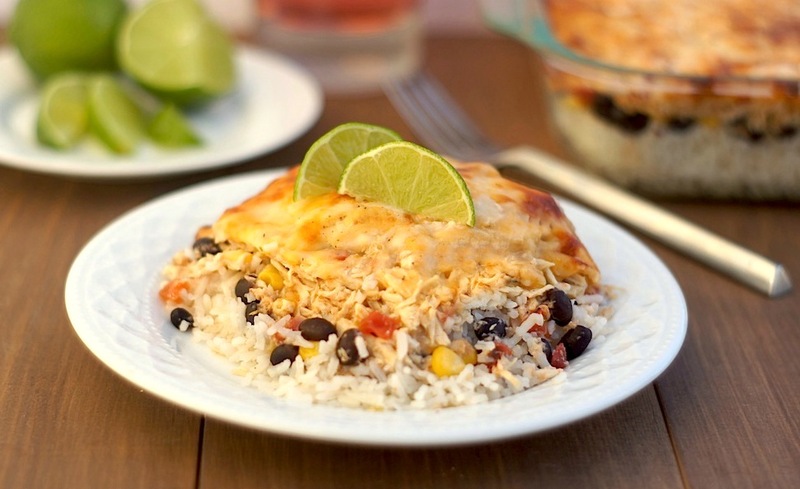 i topped that with a layer of black beans + corn, which add a great texture. next comes the enchilada chicken layer, which is truly scrumptious – tender pulled chicken mixed with green enchilada sauce, diced tomatoes with green chiles, spices, + a bit of greek yogurt for creaminess. finally, the whole thing is topped off with a generous layer of cheese, which comes out of the oven golden + bubbling. this casserole turned out wonderful – both my husband + i loved it, going back for seconds (+ thirds!). we served it with tortilla chips on the side, as they added a great crunch to the dish that was perfect. so, if you’re looking for a delicious, crowd-pleasing casserole to make, give this one a try! preheat oven to 350 degrees + spray a 9×13-inch baking dish with non-stick cooking spray. cook rice according to package directions. transfer to a large bowl, toss with the lime juice, vegetable oil, + (if using) cilantro, then salt to taste + set aside. place chicken, enchilada sauce, diced tomatoes, yogurt (or sour cream), salt, pepper + cumin into a large bowl, mixing to combine. prepare the casserole: transfer the cooked lime rice into the prepared baking dish. then, layer beans on top of rice. then, layer the corn on top. then, pour chicken mixture over + smooth evenly. top it all with the cheese. bake for 30 to 35 minutes, until cheese is melted, golden, + bubbling, + rice is hot. please don’t take this lightly: I FREAKING NEEDED THIS RECIPE. HOW LAME WAS I NOT TO SEE IT UNTIL TODAY? lame I tell ya….lame! This looks amazing. 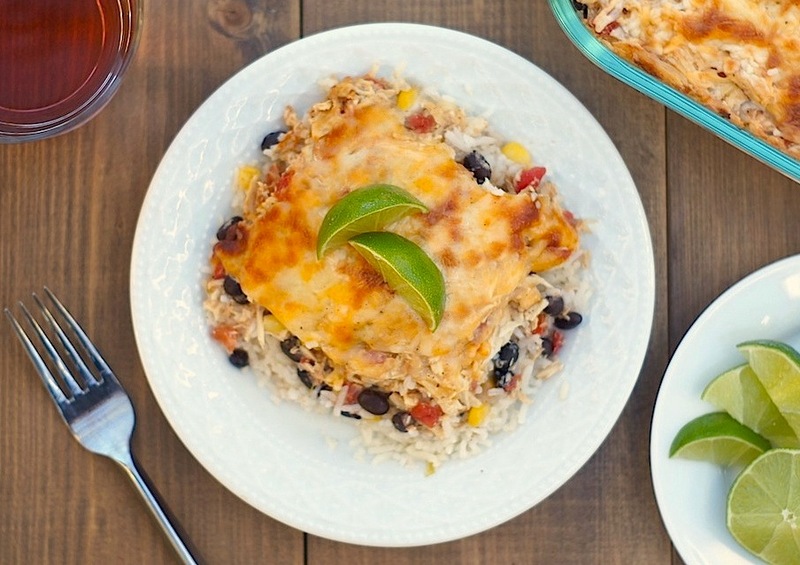 You really hit my love for mexican + down and dirty good casseroles for weeknight eating. love this! bahahaha! all that matters is that you’ve seen the recipe now. =) hope you try this + love it! Oh my gyaaash this looks delicious. Defintely making this in January….there’s no freaking time in December! I made this for dinner last night. The whole family loved it! I made this earlier in the week and it was so tasty. This afternoon we were trying to thing of a good snack for watching playoff football. I put the leftover casserole on top of some tortilla chips and broiled it to heat it up. A little salsa and they were the best nachos ever! Thanks for the recipe.